McIntosh MC-302 power amplifier. Illustration courtesy of D&M Holdings, Inc. The power amp is the component that drives the loudspeakers and it must have sufficient power to drive them, without strain or clipping, to the loudest listening level you intend to use. Most loudspeakers come with recommended power amplifier ratings in watts. Choose an amplifier somewhere in the upper half of the recommended range and you should be fine. Don't worry about exceeding the recommended power rating. A 200 watt/channel amplifier will work fine with, say, speakers rated for a maximum input of 100 watts. Just don't turn the volume all the way up! In terms of the signal path, the power amp comes after the pre-amp and before the speakers. The component chain in a home music system looks like this: Program Source (CD player, Tuner, etc.) > Pre-amp > Power Amp > Loudspeakers. No wonder there is considerable confusion about the role of power amps in two channel music systems. In reality, what any audio power amplifier does is to take the low-level signal supplied to it from the program source/pre-amplifier and increase its amplitude so that it can drive the loudspeakers to listenable levels. In other words, the output of the power amp should be identical to the input, only bigger. The speakers are the transducers that change the electrical signal into an acoustic output (music you can hear). How all of those subjective descriptions of the "sound" of a power amplifier (in the review quoted above, an AudioPrism Mana monoblock) crept into the equation, I haven't a clue. Actually, I doubt that the reviewer who wrote those words could define their meaning in concrete terms. They just sound good and help sell both magazines and amplifiers. Marantz SM-11S1power amplifier. Illustration courtesy of D&M Holdings, Inc. Note that the input sensitivity is 2v at 22,000 ohms. This matches the output of most preamplifiers and indicates that the SM-11S1 should work with the great majority of pre-amps, regardless of brand. The specs above also tell us that the THD (total harmonic distortion) in the audio range of 20-20,000 Hz is only 0.03% into eight ohms. This is very low and far below the 1% THD taken as the audible distortion threshold. The S/N (signal to noise) ratio is specified as 101 db, which is generally inaudible, so hum and hiss are not going to intrude on your musical enjoyment. Taken as a whole, this amplifier does what I suggested a power amplifier should, which is make the input signal big enough to drive the loudspeakers without audibly changing it. Power amps typically have few front panel controls. There is usually a power on/off switch, although some power amps lack even this convenience; they are intended to be plugged into the switched AC outlet on the back of a pre-amp and switched on or off with the pre-amp. Some have output meters on the front panel, occasionally with an associated range knob. That is usually about the extent of power amplifier controls. On the back panel are jacks into which the left/right outputs of a pre-amp are plugged. There are also binding posts, jacks or screw terminals to which you attach speaker wires. There should be an AC cord, which you plug into an AC outlet to supply power to the amplifier. Power amps are simple to hook-up. Just remember that the signal comes out of the pre-amp and into the power amp. A good power amplifier should be well built, inside and out, so that it will last for decades of service. It should also be shielded, so that it does not pick-up stray electrical signals from nearby electrical appliances and amplify their hum or noise. There are large transformers inside. As a result, quality power amps are rather heavy. The 110 watt/channel Marantz SM-11S1 weighs 58.6 pounds and the 300 watt/channel McIntosh MC-302 pictured at the top of this article weighs 98 pounds. 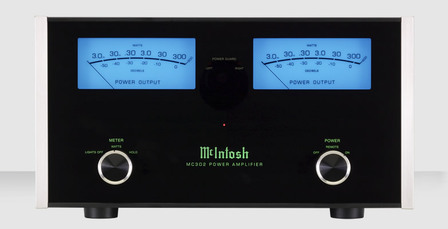 A lightweight power amp should arouse suspicion. Vacuum tube amplifiers seem to be experiencing a modest come back. They are deemed to be more "musical" than solid-state amplifiers by a segment of the audiophile population. (I wonder if they are "musical" when reproducing a narrator's voice?) Good vacuum tube power amps can be satisfactory, but they are clearly inferior to good solid-state units in every measurable way. Modern solid-state amplifiers have the advantage in signal to noise ratio, lower harmonic distortion, lower intermodulation distortion and a wider/flatter frequency response. They are also generally more powerful. These are objective, measurable--not subjective--differences. Solid-state devices are also far more reliable than vacuum tubes and have a much longer service life. The advantages of modern solid-state pre-amplifiers are obvious, while the alleged "advantages" of vacuum tube power amplifiers are entirely subjective. That said, a good vacuum tube power amp can provide adequate, if not state of the art, performance. Those rows of expensive, glowing tubes do look neat! Most power amps are compatible with most pre-amps, so mixing and matching brands--or even components from different generations--is not usually a problem. For many years, for example, I used a McIntosh C-26 pre-amp with a Marantz 250M power amp with excellent results. Previously, I had run a Dynaco power amp from a Phase Linear pre-amp. Most component manufacturers offer pre and power amps that are essentially made for each other. Using matched pre and power amps eliminates the possibility of mistakes and, of course, they look good together in your component rack. It would be hard to go wrong by matching a Marantz pre-amp with a Marantz power amp or a McIntosh pre-amp with a McIntosh power amp. A good test for amplifiers is to turn all program sources off and the pre-amp and power amp on. Set the pre-amp's input selector for a line level input (CD, Tuner or Aux will work). Set the pre-amp's volume knob at your highest listening level and see if you can hear any static or hiss from your listening position. If not, your power amp is good to go. Now, walk over to each of your loudspeakers in turn and put your ear right in front of the tweeter and midrange drivers. You will probably now hear a very low-level hiss or rushing sound. This is the combined background noise level of your pre-amp and power amp, most of which is probably coming from the power amp. As long as the noise is very soft, all is well. Many of the companies producing component stereo power amplifiers today are small. Some are practically cottage industries, assembling amplifiers in small batches. Many of the more familiar brands are actually produced in Red China or other third world nations. I feel more comfortable purchasing power amplifiers that are produced in advanced countries, such as the UK, Western Europe, Japan, Canada, Australia, New Zealand or the USA. Examples of reasonably recognizable brand names in the latter category include Marantz, McIntosh, Luxman, Crown, Quad, Mark Levinson, Linn, Sumo, Bryston and Krell.